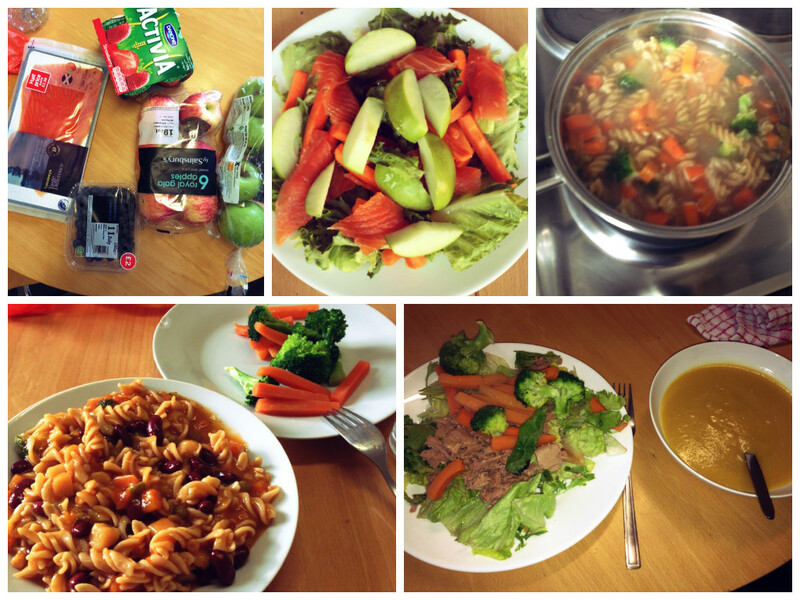 I started the summer semester eating regular college kid food: Soup and pasta, with some veggies and fruits here and there. However, as my classes increased the workload, and my friends found out about 2×1 drinks at O’Neills, I slowly started realizing that I had no energy to prepare my sources of energy. 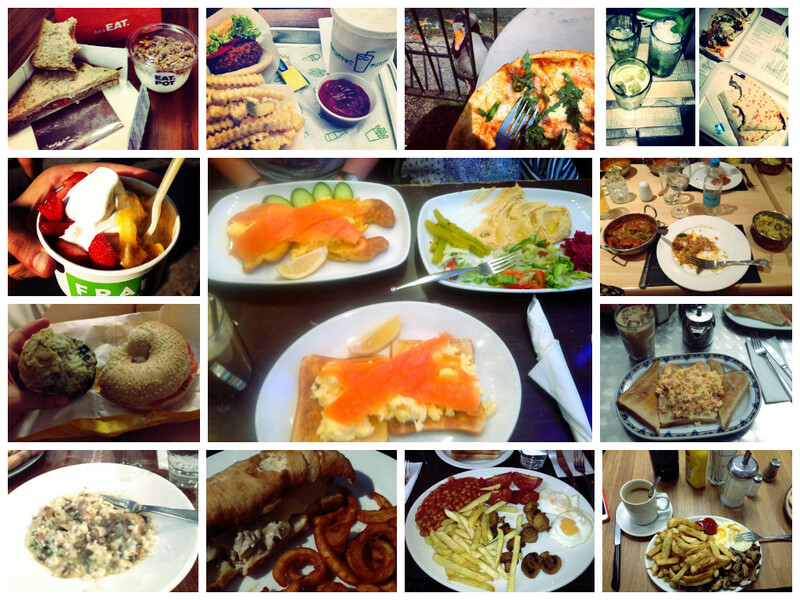 London: the food was pretty decent, my go-to places for breakfast were Le Spuntino and EAT (Pret was okay sometimes). Le Spuntino was this local family-owned Spanish and Italian restaurant next to Queensway Station. They had the best smoked-salmon with scrambled eggs I ever had! Le Spuntino also had THE best iced-lattes (sorry Starbucks). EAT was literally healthy fast food. They had pre-package sandwiches, baguettes, soups, and pastries. All made that day, nothing stored for more than 24-hours. I had lunch there almost every day I had class, which was Monday through Thursday. Dinner consisted of whatever was left in my pantry/fridge, which was always smoked salmon and whole-wheat pasta with kidney beans. Brick Lane, an area in East London, had the best Indian food and home-cooking dishes. The Indian food was amazing, and surprisingly, not as spicy as I thought it would be. I went to a family-owned restaurant, which reminded me of this place in Boston called T. Anthony’s. The platters always had fried eggs (which I ALWAYS forgot to ask for scrambled), beans, fried tomatoes, mushrooms, and a ton of the insipid French fries (which the Brits like to call chips). I genuinely loved not caring about calories in each of these delicious dishes. Paris: One word can describe my food experience in Paris, orgasmique! We stayed in Montmartre, were we had breakfast everyday at nearby coffee places. Our breakfast fluctuated from salads to omelets, to wine and pastries (yup, wine for breakfast). As our farewell meal in Paris, we decided to splurge in a ridiculously fancy seafood dinner near Notre Dame. The meal consisted of a three-course meal plus dessert. The starter was a weird-looking radioactive neon soup that was delicious. It tasted like clams with some fish broth that to me was a little taste of heaven (I am a huge seafood fanatic). As my first dish, I ordered raw salmon, which was served with tasty bread. My entrée was a fish sampler, which had cod, tilapia, and a fish I can’t recall. For dessert, we ordered Crème Brule and crepes, which we all shared. I had to be detailed in this description of my last meal in Paris, because I had never been in such a beautiful and romantic place. We were sitting outside in these comfortable seats (it would be rude to call them chairs, they were couch-like), and our menus were iPads. The service was phenomenal, and the price was worth every penny. 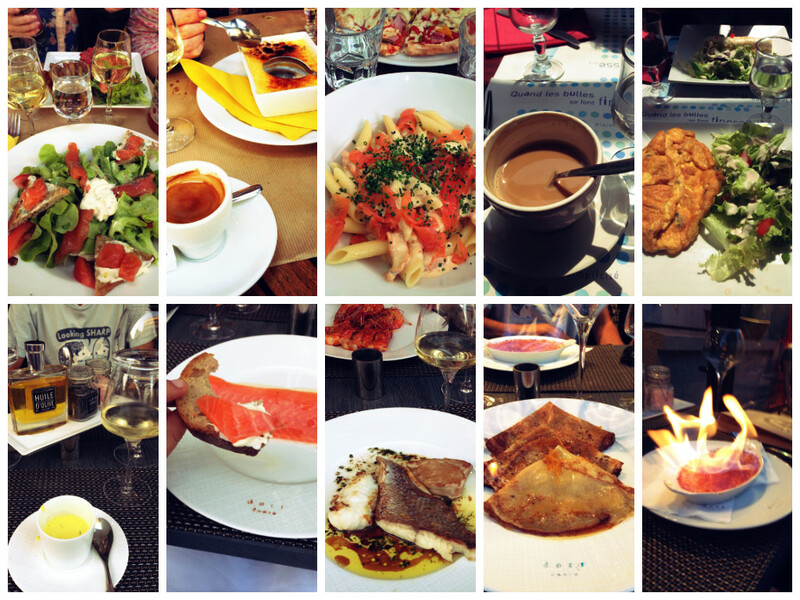 The city of love enamored me with its many delicacies and palatable foods. I have to say, if you ever plan a trip to London and/or Paris, even backpacking, I seriously recommend you to either bring extra cash to eat out at least four-times a week, or not spend on souvenirs, because you absolutely need to splurge on the food. Traveling means getting to know a new place right? Well, you need more than your eye sight to explore these two cities, dive in the culture palate-first! Previous Post How I lost 5 lbs without trying.